How Much Does A Sprinkler System Repair in Winterpark, Orlando, Eatonville, Maitland, and Goldenrod Cost? How To Repair Sprinkler System? The average cost for installing a sprinkler system for a ¼ acre is between $3,000 and $4,000. Rain sensors usually determine if it’s raining or not and adjust your sprinkler system to decrease the amount of water being dispersed if it’s raining. The cost of repairing a sprinkler system will vary depending on various factors such as the scope of the job and your location. There are different costs of installation if you live in Winterpark, Orlando, Eatonville, Maitland and Goldenrod. Say for instance you run into your sprinkler head with a lawn mower, you’ll need to have it replaced. The average cost of such a repair will be based on the materials you need to fix the sprinkler head as well as the labor. The labor will cost will be anywhere between $45 and $120 while the sprinkler head will cost you around $10. 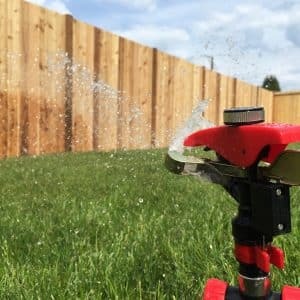 The cost of a sprinkler head installation will vary based on several factors such as the type of sprinkler head you want and the size of your lawn. You can expect to spend approximately $400 installing sprinkler heads for an average sized lawn. The cost of sprinkler heads ranges from $2 to $10. The average cost of repairing sprinkler heads will range anywhere between $40 and $300. There are different types of sprinkler heads as listed below. However, pop-up sprinkler heads are usually more expensive than all the other types. Rotary sprinkler heads are installed slightly above ground. When in operation they move in a back and forth motion or in a circular path producing a constant stream of water. Shrub sprinkler heads are specially designed to reach the roots of garden, trees, and shrubs. Their main advantage is that homeowners can mount them to effectively water the roots. Flood sprinkler heads are perfect for irrigating small trees, shrubs and gardens. These heads work in a similar way to heads found in major farms. They produce enough water that saturates the ground and gets to the deep roots of the plant. Gear-driven sprinkler heads offer the best flexibility as they can be adjusted to water different parts of the lawn. In addition, they move quietly using a series of gears. Fixed spray sprinkler heads are perfect for when homeowners want to water a particular part of their lawn. This type of head uses a fan motion to saturate lawn. It can spray water to a maximum distance of 15 feet. Pop-up sprinkler heads are the most popular kind and can be used on both small and large lawns. To operate, they rise out of the ground and disperse water. Once they’re done, they then drop back to the ground. This means that they’re not easily damaged as they’re usually out of sight most of the time. If you would like to have your sprinkler system switched on and off at predetermined times then you’ll need a timer. Every now and then timers malfunction and this might mean that you might end up with dead grass on your lawn. 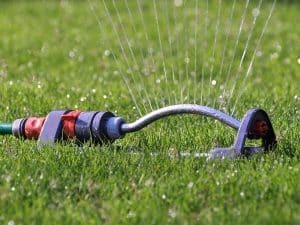 Depending on the scope of the malfunction, a sprinkler system timer might cost up to $200 to either repair or replace. If all you need is to have your timer reset, it’ll cost you around $50. The cost of a rain sensor ranges between $30 and $100 depending on its features as well as the brand. Installation costs are determined by whether it’s a hardwired or wireless unit. You should expect to spend as little as $45 to as much as $150. 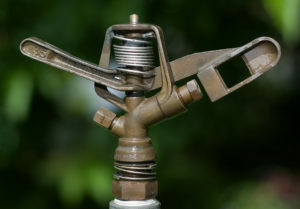 Maintaining a sprinkler system means that you’re getting different components up to speed. You have to factor in the cost of various components as some will have to be replaced. This might include valves, sprinkler heads, and controllers. You can expect the price of the various components to add up to $400. Depending on the amount of time involved as well as the condition of your sprinkler system you can expect to spend $300 or more. A pallet of sod usually covers approximately 450 square feet. The average cost of quality sod is $0.50 per square foot. There are different types of sod and these are sold in various prices depending on the grade. Fescue economy grade goes for approximately $132 while you can get the high grade starting from $300. To ensure your sod grows you will need to water it regularly. If your sprinkler system is not well maintained, it might mean that you have to buy new pallets of sod to replace the ones that got destroyed.